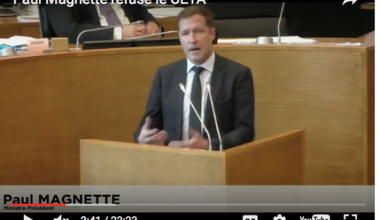 Paul Magnette is a Belgian politician, Chairman of the PS and former political science professor at the Universite Libre de Bruxelles (ULB). He is the current Minister-President of the French-speaking region of Wallonia and the current mayor of Charleroi. A patched deal allows CETA to pass to the next stage. But Belgium gained important concessions. We translate the historic parliamentary speech by the Minister-president of Wallonia in Namur on October 14, 2016.